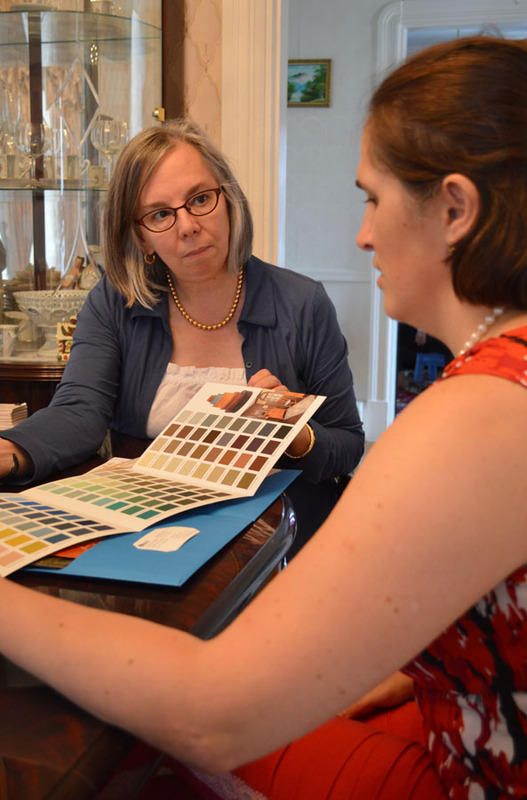 This month, Historic New England ran a radio contest and the main prize was an on-site consultation with Senior Preservation Services Manager Sally Zimmerman, an expert of historic paint colors. Sally paid a visit to contest winner Camelia Leone at her early 1900s house to talk about appropriate paint colors for her house and to provide a bit of history on the property. Historic maps showed that the house, originally owned by a fruit dealer, occupied one of the largest parcels in the neighborhood and, indeed, a family member still living in the area told the Leones the house was once surrounded by apple orchards. Sally told Camelia how to bring out the Colonial Revival style of the porch and trim using a softer off-white color that blends with the house’s beige siding. Deep green doors and porch lattice would add further interest to the entrance. Inside, Camelia has preserved original woodwork and decorated to bring out the home’s historic character. Sally suggested a warm off-white shade for the trim here to accent the rose-colored floral tile on the fireplace along with darker wallpaper treatment on the highlight the wainscot area of the stairwell. Sally is in charge of Historic New England’s Historic Homeowner membership program and, while the on-site visit was a special bonus for our contest winner, all Historic Homeowner members enjoy access to information that gives them a richer understanding of where they live, who lived at the property, and how it changed over time.